Alan, Laurie is my cousin and lived next door to the Newman’s who I believe lived next door to you. My family (Raymond and Hazel) lived in the first court up, number 2, The Mead, next door to the Flashman’s, which was interesting! I was at the Tech 1951/56 and Yes the science block was still by the church. Gerald, If your brother Robert Jones went to Chelmsford Tech from 1940 he was ahead of me and I would not have known him. I was there 1947-50. Your brother must have been there when errant bombs, presumably meant for Marconi just down the road, demolished part of the Tech. It must have been a surprise to show up that morning and discover the overnight disaster. I wonder, ongoing, how the Tech handled the same number of students with a large number of classrooms non existent. Perhaps that is when the so called Science Block, behind the cathedral, came to be used. It was still used for science when I was there. My brother Robert (Bob) Jones (deceased Aug 2018) who lived in Langdon Hills travelled by bus to attend Chelmsford Tech from 1940 onwards. Just wondered if the name was familiar to you both. Barri, Are you part of the Cutler family that lived three or four up from the High Road on King Edward Road? Memory says it was odd numbers on the right so you might have number 7 or thereabouts. If so we were near neighbours as we were 2 King Edward Terrace. Did you not have a brother, Lawrence or Lawrie? Hi Alan. The double deckers did indeed run through the High Road. I went to Chelmsford Tech (a complete waste of time) and we started off with the single deckers and later the doubles went through to Billericay and Chelmsford. I can remember sitting at the front upstairs one snowy morning and the bus sliding sideways down a hill. We used to have great elastic bands and paper pellet fights until the girls decided to join us and the fighting stopped and other activities took its place. I remember the double decker buses that went to Laindon train station. When I started work in London in 1972 I travelled on the 243 double decker bus from a bus stop in The Knares, Lee Chapel South to Laindon Station as there wasn’t a train station at Basildon at this time. Memory says that, at least into the mid 1950’s when I left, there were double decker Eastern National buses at the station. I do not remember them ever traveling through the High Road and suspect they were only used on the south bound routes to Tilbury etc. I assume the parking spaces for waiting buses were assigned. By whom, or on whose authority, I have no idea. 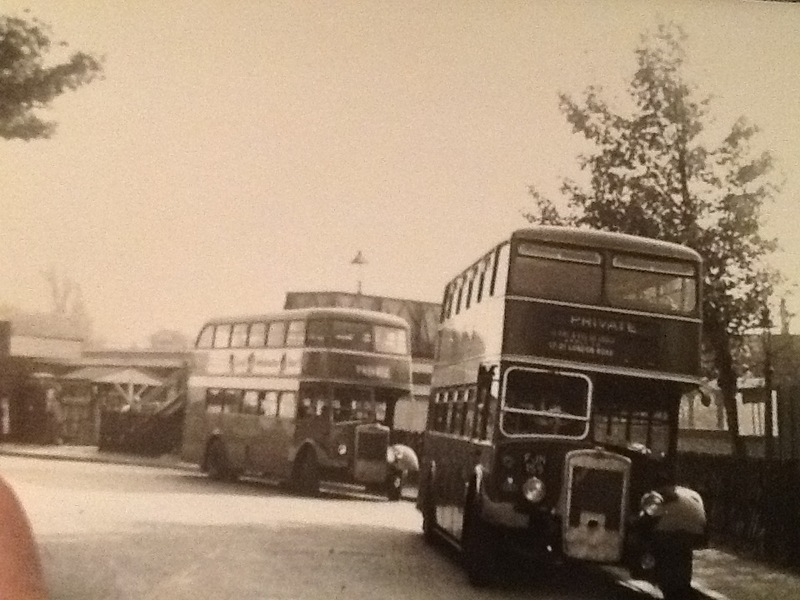 The double deckers were always parked at the top of Station Approach on the left. The City buses seemed to have the prime parking spots at the bottom closest to the railway exit gate. At least that’s how I remember it. The 244 bus from Laindon Station to Basildon Town Centre. The fare 2 pence old money for me as a 8 year old in the late 1950s probably around £2 today. I can remember the buses like this at the station. So Lovely to see the photo, Thank you.